Nori was a dear friend that I worked with about 25 years ago. She had the kindest heart, and was an absolute pleasure to work with. It was then that she shared her fried rice recipe, and I make it to this day. There's very little prep work, and sometimes I even buy the white rice already made from my favorite Chinese restaurant. The beauty of this recipe is that you can also add some of your own favorites, but my rule of thumb is, always make a recipe as is the first time around. Then you have a good starting place. Heat olive oil in large sauté pan or wok on medium/high heat. Add garlic, stirring for one minute, or until brown...do not burn. Add shrimp and cabbage and stir fry until shrimp turn pink (if using cooked shrimp, add after a few minutes of cooking cabbage). 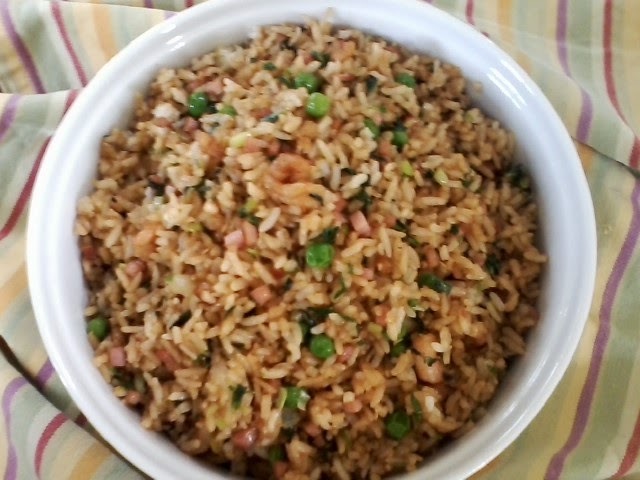 Add rice and bacon and stir fry until the rice is evenly coated with the oil. Add soy sauce, oyster sauce, sesame oil and salt and pepper to taste....you may like more soy than oyster, or vice versa. 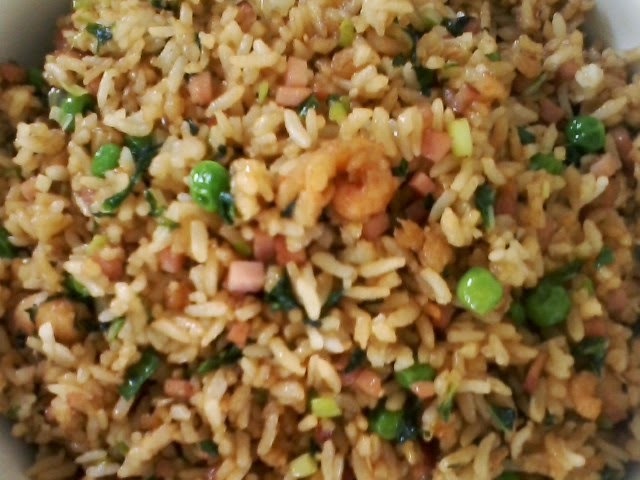 Stir in peas and green onion and cook for another 2 minutes. Bon appetit! Combine all ingredients, except for chocolate chips, in a standing mixer. Have mixer on low for the first 2 minutes, then medium for the next 3. 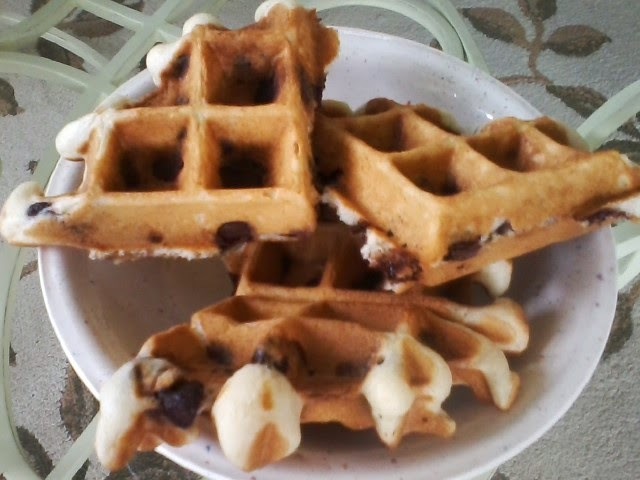 In a medium bowl, add chocolate chips, along with 1 tsp flour. Toss a number of times to coat chips with flour. 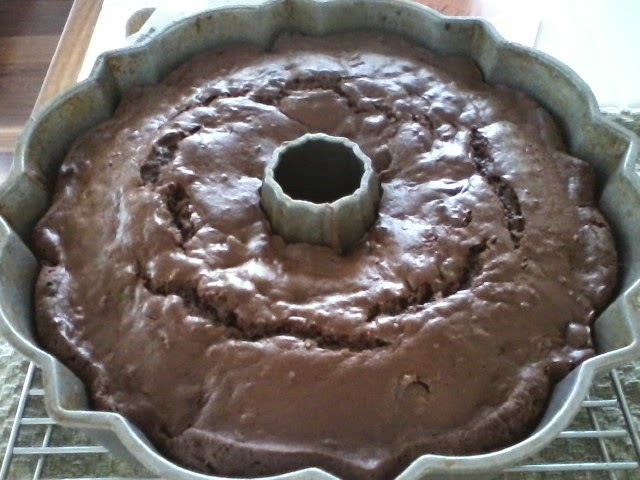 This will prevent the chips from sinking down to the bottom of the cake. Use your fingers to put chips in mixing bowl...toss any remaining flour. Stir chips into cake. Grease and flour a bundt or tube pan. Pour cake batter into pan, distributing evenly. 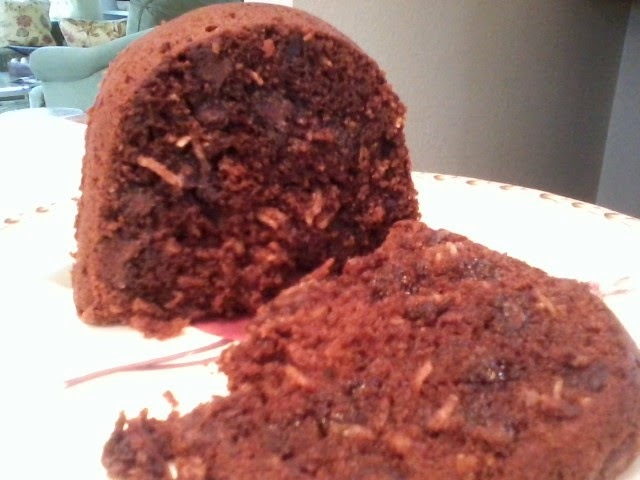 Bake at 350 for 45-55 minutes, testing a few times with toothpick, as sometimes you hit a melted chocolate chip. 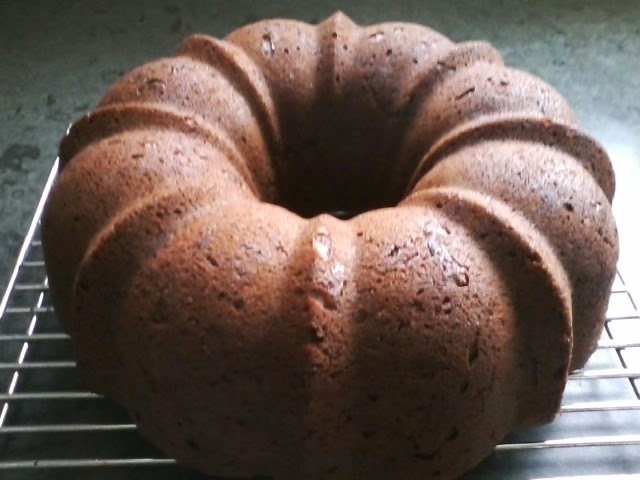 Always err on the side of the minimum amount of time to bake anything...you can always put something back in the oven, but you can't undo something that's overbaked. Bon appetit! I wanted to get something out to you today, and I played around with this recipe. It's not rocket science or anything, but the putting together of all the various sizes of the hearts was a little time consuming. As I am writing this, my experiment is in the oven, baking. 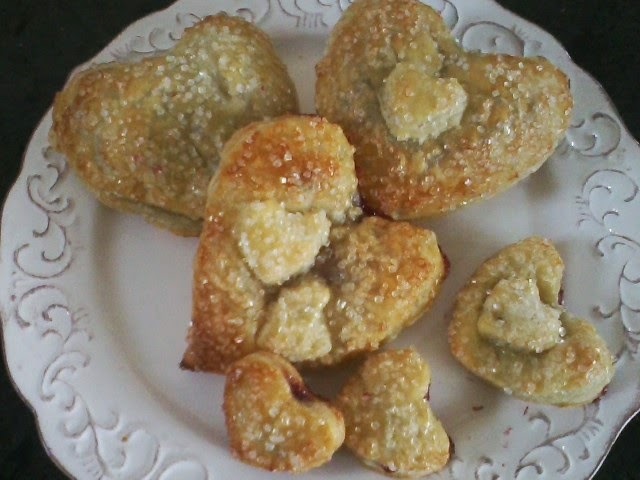 I almost don't want to look when the timer goes off for fear I will see raspberry filling exploded all over the pastry, the pastry not looking like hearts anymore...all kinds of scenarios. But, the timer "will" go off in a bit, and then I will know. In the meantime, here is the recipe. Unfold the puff pastry on a floured counter and you will see 3 sections. Cut them along each seam so you have three pieces. Lay two pieces aside. 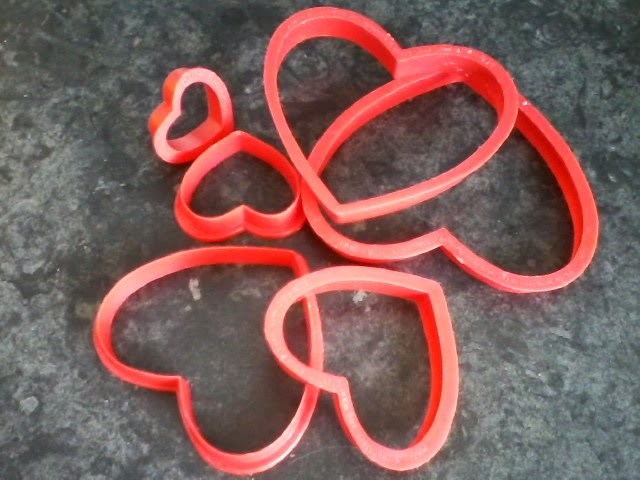 With a floured rolling pin, and the piece lying lengthwise, I pretty much kept the width the same, as I was starting out with a 4" heart cookie cutter. 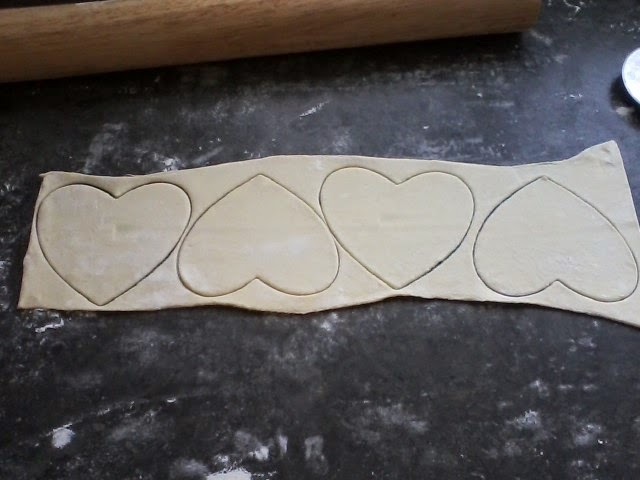 I rolled the length to 14", so I would get four hearts. 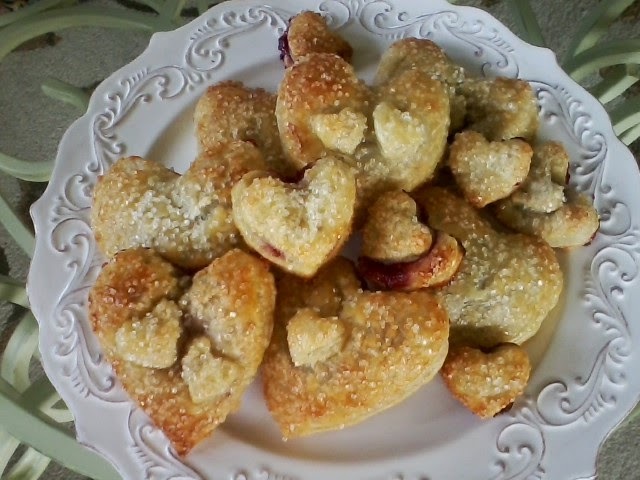 The plan was to have 12 heart pieces total, so I would get 6 pastries. 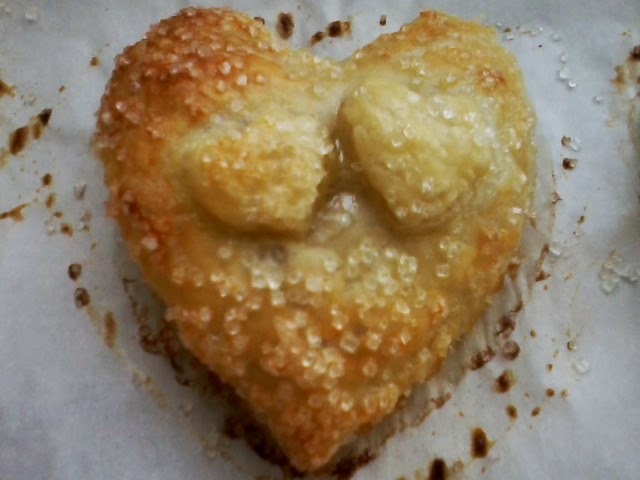 That said, I hated to throw out the leftover puff pastry, and rolled it again 3 more times and cut out hearts of all different shapes. If you have any shapes without a partner, just place it on a larger heart. 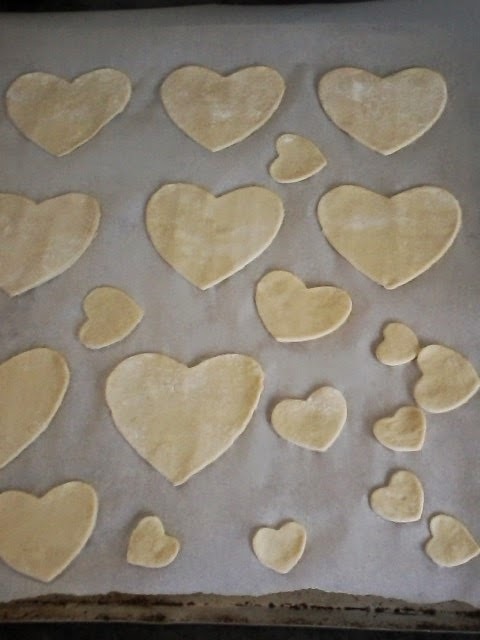 Okay, you have your preserves in a bowl ready to go, along with your egg wash, and you have all of your cut out hearts on a parchment paper-lined baking sheet. Brush a little egg wash around the perimeter of the bottom heart. 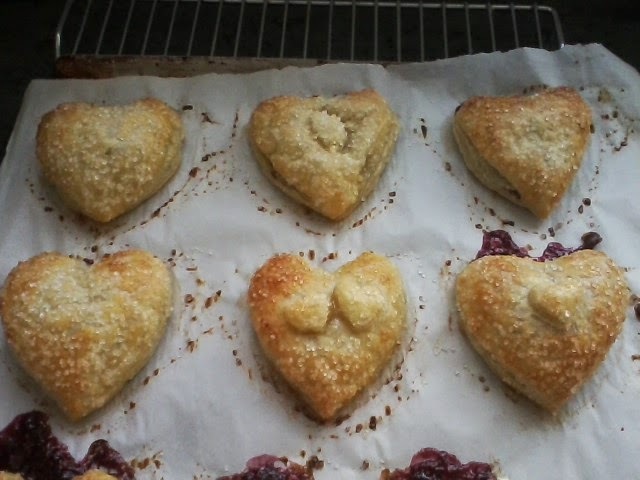 Put about a tsp of preserves in the hearts, a little more, a little less, depending on how large, see picture below. You want to make your filling on the heart in the shape of a heart as well. Place the second on top, using your finger to lightly give the edges some pressure. If you want to place smaller hearts on tope of larger ones, just brush egg wash on the smaller heart, and place on the larger one. So all of your hearts are in place. 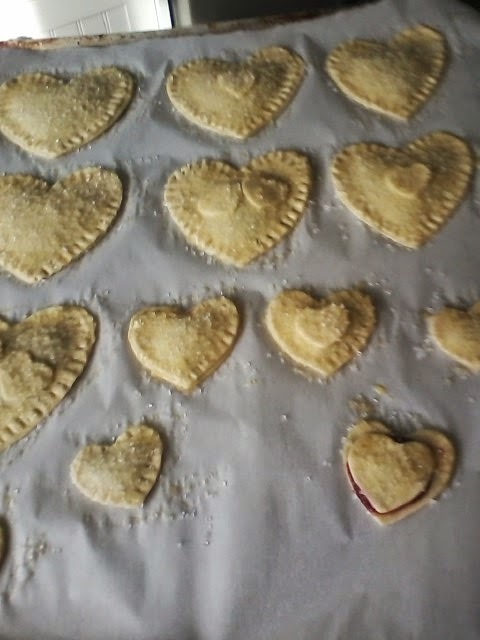 Using a fork, put crows feet all around the hearts to make sure they seal. Refrigerate your baking sheet for 20 minutes while you preheat your oven to 400. 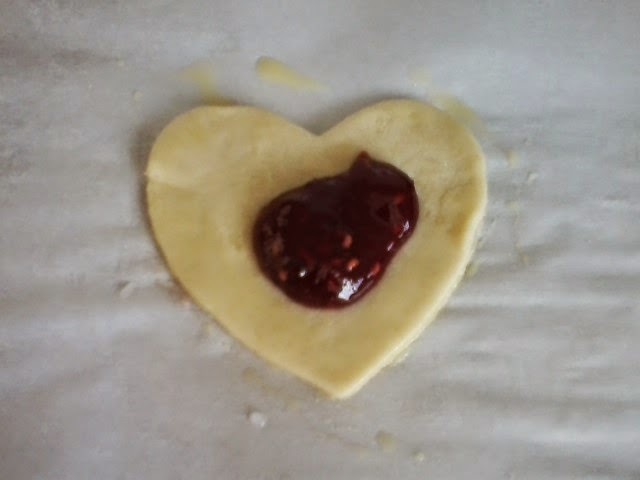 Take the baking sheet out, brush the tops of all the hearts with eggwash, and sprinkle with sanding sugar. Bake about 15-18 minutes, or until brown. Bon appetit! Valentine's Day...Where Are You, My Valentine? I adore valentine's day. If you are as old as I am, which is almost 58, you will remember when we bought those little cards that were one-sided, and you wrote your note on the back. They also came with little square envelopes that were fairly thin, so you knew it was a valentine. When younger and giving these cards, us kids would try our best to just lay them on our friends' desks at school. This tactic was used especially if a girl was giving one of these cards to a boy. I also remember when my dad left school after he taught, he would stop at Gladstone Bakery on Milwaukee Avenue and get my sister, brother and me cupcakes that were lightly tinged with pink frosting, and a heart stuck on top. To this day I remember those. And, what about the little boxes of small heart candies with all the sayings on them? I recently mentioned on facebook that one valentine's day, my late husband flew into Chicago to surprise me at work after he had been recalled to his previous job in San Francisco. It was such a lovely gesture, but actually turned disastrous as we had a huge argument. To this day I also remember that, and still feel badly. I have always been a romantic...flowers for no reason, being called during the course of a day just to be told I was being thought of, lit candles on a table, a little gift that actually had thought put behind it...not something the giver wanted themselves, but something they knew I would be tickled with because they took the time to know "me", and what "I" liked. Now it is a few years later after my late husband has died, and I have no regular sweetheart...I thought I did, but I guess not. It's quite painful, and on the day where my heart should be in love, my heart is breaking. I so want another partner...someone to talk to about anything, and everything; someone to hold, whether it be on the couch watching tv, or in bed; someone who wants to sit outside in the middle of the night and watch the stars; someone who is spontaneous, and may buy a little jar of child's bubbles to blow, or draw out a hopscotch game with chalk on the sidewalk. I don't know if ever I will find him, and yes, it now brings a tear to my eye. I so want to be in love again...I'm in love with love. Where oh where is he? A friend of mine said awhile back that "he's" just around the corner...my reply was, what corner? give me the street intersections. Many have also told me...just be patient, don't think about it and then it will happen, enjoy your own company. But dammit, I get tired of enjoying my own company. Yes, there are meetup groups, but if you're out to find a sweetheart, you will find that if 30 people sign up for something, 27 of them are women. Am I lonely, yes; am I feeling sorry for myself, you betcha; but if I can't do it, who will do it for me? Tomorrow is Friday the 13th...my lucky day...maybe something will happen along the lines of love. I can only wish, I can only hope...with all my heart. 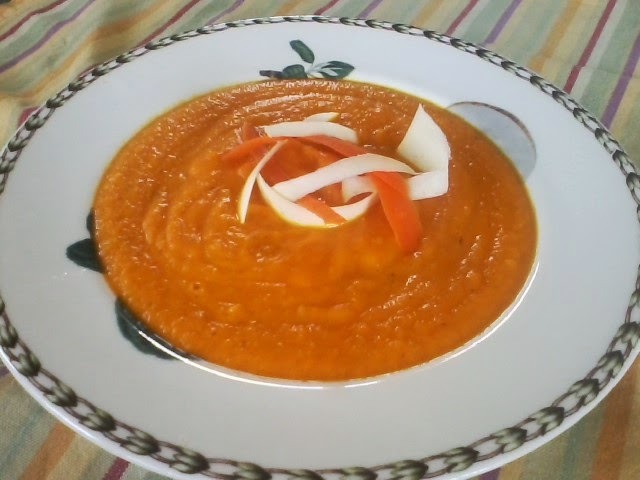 As I explained with the first roasted carrot soup I featured, most people like this with curry. But there are those who don't care for curry, hence the two different recipes. With this particular soup, I roast carrots, strips of fresh ginger and the onion together after mixing in a bowl with olive oil and brown sugar. It not only roasts the vegetables, but coats them with a sweetness. 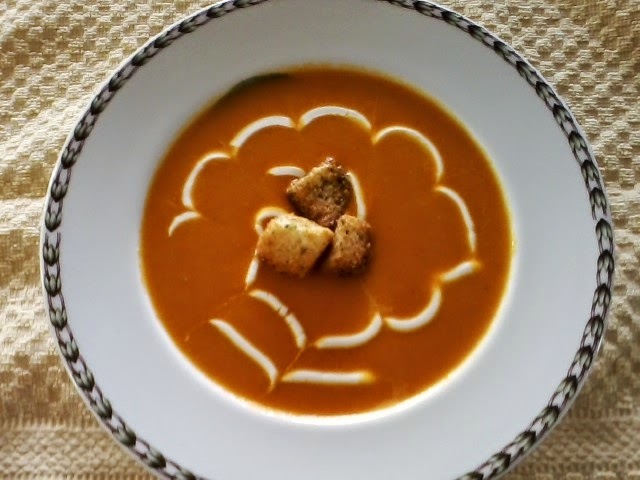 Although the veggies then go into the soup, the coating dissolves, leaving a sweet undernote. Also, when I started pureeing the soup, I started with two of the strips of ginger...if you bite into it after roasting, the impact is still pretty much there, but the ginger is now somewhat candied. You may want to start this way also, and keep adding the ginger to your own liking. Same with the curry powder. I finished off the soup with a little sour cream put into a ziplock bag, cutting the tip, and swirling around the bowl. Taking a toothpick, you can go any which way you want...you can't really ruin it unless you play with it too much. Mine sort of took on a flower pattern. I finished with a few croutons. Put carrots, ginger and onion in a large bowl. Add the olive oil, brown sugar and salt. Mix with hands. Place on a parchment lined baking sheet and bake at 400 about 30 minutes, or until carrots just start to brown. Remove from oven. In a dutch oven, pour in chicken stock. Add the carrot mixture, stir until combined. Bring soup to a boil, then simmer on low for 10 minutes with lid on. Remove the ginger pieces. 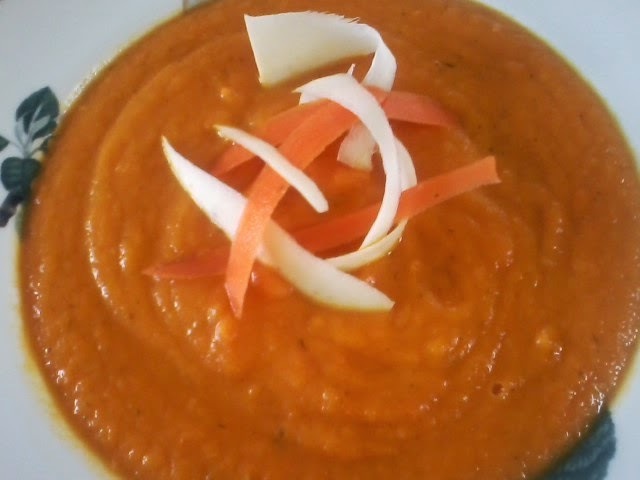 In batches, puree carrot soup mixture, along with 1-2 ginger strips, tasting and adding more if you desire. Put soup back into dutch oven. Add curry powder, 1 tsp at a time. Bon appetit! Many people wouldn't think of carrot if they were asked to name what they thought were the top 5 soups. To me, it's somewhat of an afterthought of a soup. Most recipes are made with curry to give the delicate flavor of the carrot a kick. But, there are those who are not fans of curry, hence, this recipe. Parsnips are in the carrot family...carrots have a sweet taste, whereas a parsnip can a sweet/spicy taste, but nothing like curry. This soup has more of a quiet taste of carrot, parsnip, thyme and white wine. A pretty basic soup, but the roasting of the carrots and parsnips gives it a little edge over just steaming them before beginning the soup. Place carrots and parsnips in a large bowl with the olive oil and brown sugar. Bake in a 400 oven for about 30-40 minutes, until the vegetables start to brown. Remove from oven. In a dutch oven, heat the butter and saute shallots until translucent, about 5-7 minutes. 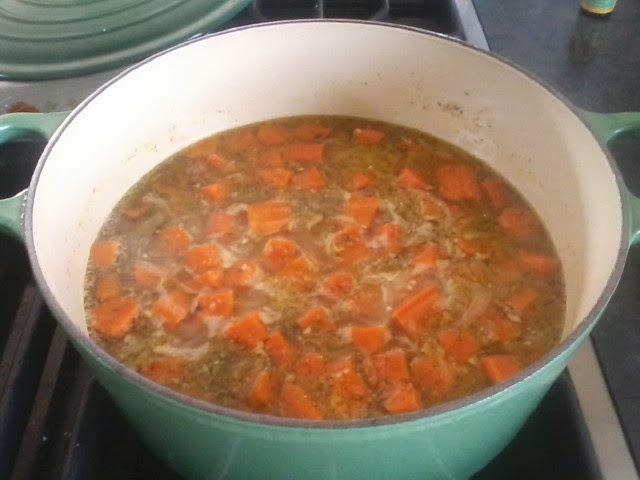 Put carrots and parsnips in pot with shallots, then add the chicken stock, (see below). Stir and simmer on low for about 15 minutes. Add white wine, salt, pepper and thyme, and simmer for another 10 minutes. Put soup through blender, I use my Nutribullet, to liquefy. Put back in dutch oven. At this point, you may need to add more chicken stock if the soup is too thick for your liking. Add, then put back on low heat for another 10 minutes. Bon appetit! In the picture below, I peeled some carrot and parsnip for garnish.